Sure, the Oscars took place last week, but that does not mean we have to stop writing about jewelry and clothing that we spotted at the event. It is never too late to discuss Academy Awards night finds. 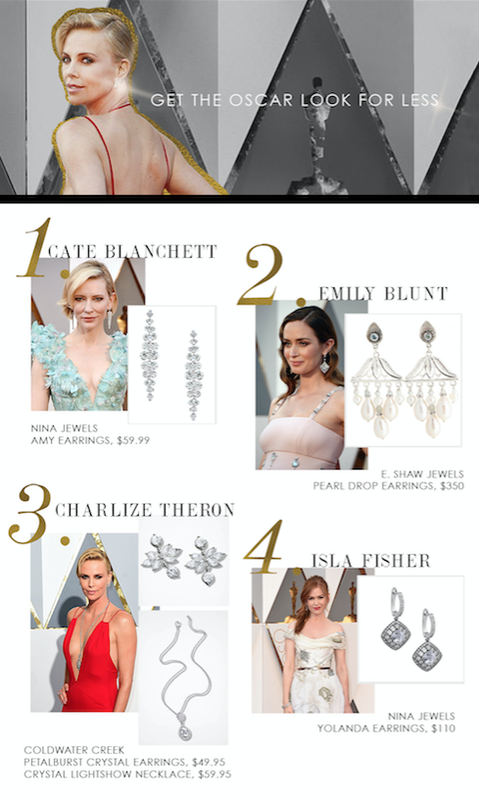 Statement jewelry (especially earrings) was all the rage last weekend on the red carpet of The 88th Annual Academy Awards ceremony. As gorgeous as these gems look, not even celebrities are paying the hefty price tags for them… If you’re interested in recreating these extravagant looks from some of the best dressed ladies of the night, Nina, Coldwater Creek and E. Shaw Jewels have more affordable jewelry versions!